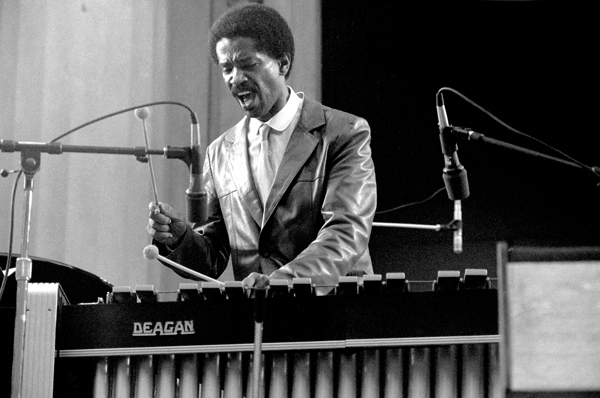 Bobby Hutcherson, performing at the Berkeley (CA) Jazz Festival in 1982. My life would undoubtedly have taken a different path were it not for Bobby Hutcherson. His approach to the vibes set me on a course of trying to understand ..... How can you pull so much beauty and energy out of 37 cold metal bars? I still thrill every time I hear him play those signature intervallic patterns of his, staggering them up and down until the instrument sounds like its 6 octaves long. Or to hear him play a ballad ..... to be witness to his own waiting, waiting to play that one phrase that will make you feel your own heart inside your chest. I wanted to play like THAT ..... wanted to figure out what he was doing and make it my own. Of course, I never did! I found my own voice by trying, and failing miserably, to sound like Bobby. I reached and fell, reached and fell. And in falling found myself. It was Bobby, more than anyone, who made me want to reach. Over the years, and because he is a kind and gracious man, I've had the opportunity to sit with Bobby and talk, or have a pleasant chat on the telephone. Each time was a gift and a lesson, and each time let me further understand that the great music I loved was a reflection of the great person who created it. I still aspire to be like Bobby, but maybe now in a different and deeper way. I still wanna be like him because to me Bobby Hutcherson represents the best of what being human is all about. And isn't it funny that, after all the recordings, all the concerts, all the MUSIC ...... I'd love him, even if he had never played a note.